That’s a question we’ve all had in our careers. Usually there is one “bottleneck” in our system, one thing that is not working and it keeps our results from happening. Finding someone to talk to? Knowing what to say to break the ice? Getting an appointment for a presentation? Following up to get them started right? Everyone is different. We all have a personal barrier holding us back or slowing us down. Professional networkers quickly identify it and then learn the skills to fix it. What is the one thing holding back all of my progress? Should you help your distributors grow into leaders? Of course, but you have to be selective. You don’t have time to help everyone. If you ask your team, you’ll see that almost everybody wants to become a leader. But the world is full of wishers and hopers. So, how do we know who the serious distributors are? Give them the Leadership Test and see who passes. If the distributor calls you on Friday, here is someone serious you can work with. If the distributor doesn’t call you on Friday, the time isn’t right for them to start becoming a leader. Think about it. If reading a book is too hard, the path to leadership will be way too hard for this distributor. Instead, let’s concentrate on using our “Ice Breaker” techniques to get the prospect to lean forward and ask us for a presentation about our product or opportunity. That way we never set off the salesman alarm. Need some great Ice Breakers? Check out a whole book of Ice Breakers here. Do you have trouble getting prospects on an opportunity call? Are they afraid of being “sold” by listening to the sales presentation? This is a great way to involve your leads and prospects without creating resistance. If you work hard to find leads, why not do your best to help them see your business in a stress-free way? Tools are for … amateurs. Many distributors use tools to build their business. They buy CDs, DVDs, magazines, literature, samples and more to hopefully get their prospect interested in their business. But have you ever seen a big leader carry around a big flipchart? A PowerPoint presentation? Handfuls of brochures? The leader has learned the skills of how to get the prospect interested by changing the prospect’s mindset. And tools do a lousy job of changing people’s mindsets. So if you are a brand-new distributor, of course you’re going to spend lots of money on tools because you don’t know what to say to change your prospects’ mindsets. But, as soon as you can, learn the skills of changing your prospects’ mindsets effectively and immediately. Learn how to talk to people. When you don’t have time to build a relationship for your business. When you contact a referral, or when you call a prospect from a list of leads, you don’t have days or months to build a relationship. So how do you present your opportunity? Don’t start with all the neat benefits of your opportunity. Don’t tell the prospects about the wonderful bonus checks, the trips, the cars, the incredible products, the company founder’s background, etc. Instead, remember that people buy things to solve a problem. So position your presentation to solve a problem for your prospect. Talk about how your opportunity will make it easier for the prospect to take more time off work, how your opportunity will make it easier to pay bills with that extra check every month, or how your opportunity will provide the extra car for the spouse. Prospects don’t care how great your opportunity is. They simply care about their problems. That’s the shortcut when you don’t have time to build relationships. 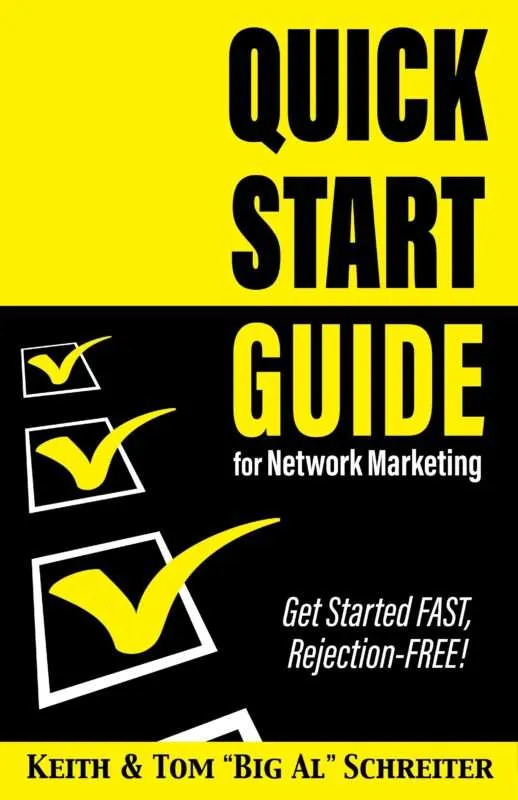 Network marketing is a lot easier when you know what to say and what to do. I am shy. How can I change and overcome my fear of talking to people or selling to strangers? Have you ever noticed that the successful network marketers have a positive personality type? Does the positive attitude come from them being already successful? Or, maybe these successful network marketers had the positive attitude first — and that positive attitude propelled them to success? While it is easy to have a great attitude when you are already successful, usually the positive attitude comes first and demonstrates itself by attracting success. How can people overcome their fear of contacting prospects? It’s a matter of desire. People usually get what they want most. For instance, there is a choice between a good television show and attending an opportunity meeting. Some people will want to see the television show more than they want the success that comes from attending opportunity meetings with guests. So, they watch television because they truly want that more than the long drive to hear a boring speaker at the meeting. The same holds true when talking to people. What does a person want more? Does this person want the calm, non-threatening day-to-day life void of rejection? Or, does this person want prospecting success more than he wants to avoid rejection? Sobering, isn’t it? Many people say they want success, but deep down they want activities that pose a lesser challenge. Where can I find good prospects? So of course, most people are pre-sold prospects already. But, when we talk to them, they don’t trust us, they don’t believe us … so they pretend to not be prospects. The first rule is to build rapport. That means getting them to see that we see the world the same way as they do. So for example, we can start a conversation by saying, “You know, jobs just take up so much of our time.” If the prospect agrees, the prospect feels more trust and will believe other things we say. But for the vast majority, we will have to build rapport and use good communication skills. Start with people who have a full-time job and a part-time job. They are motivated. They are willing to do more. And they don’t want to work two jobs for the rest of their lives. Excellent prospects.